The story behind the naming the habitat goes something like this. 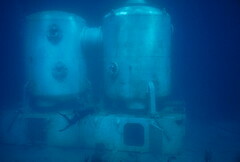 The original design came out of GE’s space division and someone at GE figured that it could work as an marine habitat. When working on what to name it, they came across the definition of a tektite as something from space that lands on the ocean floor. 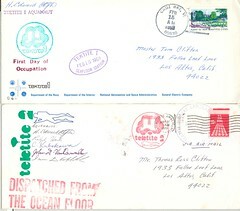 I was a ‘shrinklet’ (behavior observer) on Project Tektite 2, and was assigned there when the 2nd letter was postmarked (May 8, 1970). One of my secondary duties involved shuttling items to and from the habitat, command van, and base camp. There’s a possibility that I (or one of my fellow UT Austin peons) delivered the letter to base camp, to speed it on its way. Far Out!